First Floor: Open plan split level kitchen/dining/sitting room with patio doors to covered terrace (A/C, oven, microwave, dishwasher, WiFi, TV, DVD, fireplace). Principal double bedroom (twin beds made up as a double) with dressing area, en suite shower room and patio doors to covered terrace (A/C). Single bedroom. Two shower rooms. Twin bedroom. Double bedroom. Open plan sleeping area (children's single bed: 80cm x 185cm) with door to rear terrace. Central heating throughout the house. Outside: Spacious gardens of lawns and flowerbeds. Tennis court (basketball net). Poolside shower. Covered and open terraces. Fish pond. Orchard. Gym. Table tennis. In-built barbecue. Covered private parking. Laundry room (washing machine). Private solar heated swimming pool (12m x 9m at widest points) with Roman steps. The tall conifer hedges that line each side of Torre de Valle Miñor’s driveway provide such wonderful privacy that it was not until we reached the house itself that the beautifully landscaped garden and expansive rural vista offered by this idyllic country home were fully revealed. Sweeping elegantly beyond the property’s stone-pillared façade, lovingly-tended lawns weave their way between shrub-filled flowerbeds; the colourful blooms of prize-winning camellias compete for attention with fruit and magnolia trees; in intimate corners, wisteria-covered terraces and shady nooks provide welcome retreats from the sun. In the centre, the generously proportioned pool exudes an almost tropical feel thanks to the palm trees that stand proudly along its edge. It was these luxuriant grounds that immediately caught our attention and as we looked ahead we were further captivated by the far-reaching views of lush wooded countryside that accompanied them. Beyond neatly clipped hedges a verdant expanse of treetops stretched out towards forested hills to provide the most restful of backdrops and an essentially rural feel. We were, however, only 1.5km from a good selection of restaurants and amenities in the bustling local town of Gondomar and an easy 15 minute drive from the sandy beaches that stretch alongside and beyond the coastal town of Baiona. Inside too, we could not fail to be impressed. Until recently used by its owners as a much-loved summer retreat, the thoughtfully planned rooms ooze comfort and style. Topped by a lofty ceiling and illuminated by contemporary spotlights, the spacious living area incorporates kitchen and dining on an upper level and a cosy sitting room just below, its open plan design allowing views from all parts through patio doors to the garden. Just off the dining room, a smart corridor of polished wood leads the way to the neat bedrooms and fashionable bathrooms where the exquisite sense of style continues. At the nearby beach of Playa America -a blue flag beach which the locals consider to be a 'Queen of beaches', due to its clean water, fine sand and excellent facilities. The seafront has great views over the bay and the boats arriving in the Marina. It's around 12 kms long so you might feel the need to stop for a cool glass of local wine and some tapas in one of the many bars and restaurants which line the street. There are 5 walking routes running alongside streams, water mills or pre-historic excavations plus a 'botanical garden' path and a road that takes you to the top, with stunning views and a restaurant and bar to quench your thirst. The area around Gondomar where Torre de Valle Miñor is situated is awash with pre-historic sites which you can discover on your walks - Celtic settlements, tombs, pre-historic drawings are included in some of the best sites in the North of Spain. It's a lovely old town to stroll through with shady squares for a coffee. Lunch on Tapas in the Plaza de Leña. It's a good spot to stop for lunch with some excellent open-air restaurants offering an amazing choice of seafood. It's known as the 'beach of the waves' and there are a couple of surf schools based there too which cater for all levels. Added bonus is the view over the Cies, plus the lovely white sand. Or walk through the sand dunes to sweet-smelling eucalyptus groves, watch for rare species of birds or enjoy a meal in the islands' restaurant. Dating from Roman times, and one of the seven ancient capitals of Galicia, the town has much worthwhile architecture scattered through its narrow, granite lanes. If you come across Clares Convent be sure to buy some of the almond cakes made by the nuns who live there. Drive or walk over the iron bridge (built by Gustave Eiffel) to the Portuguese walled town of Valença, a quaint and picturesque place with lovely views over to Tui. And if you happen to need some more towels for the beach this is the place to buy them. The market here is very popular! Get active in the sunshine! From go-karting surfing, tennis, sailing, rambling, horse-riding - almost every activity possible on land, sea or sky can be found nearby in the province of Pontevedra. La Lanzada, Sanxenxo or Playa América beaches are the best places for an active day by the sea and there are plenty of river activities available in the Miño. Pick up a bottle or two in Gondomar town and whilst there, pay a visit to the enormous Gondomar Manor House dating from the 16 century. Gondomar is a good place to buy wickerwork too. Wander along the hillside walks to the lighthouse, look for the Roman remains and take a picnic too as there's a picnic area there. You can visit a replica of the vessel in Baiona Harbour decked out as it was in the days of Christopher Columbus, with models of the crew, native Americans and even the exotic animals of the newly discovered land. Spas claim to offer benefits not only to your skin but also to your general well-being. 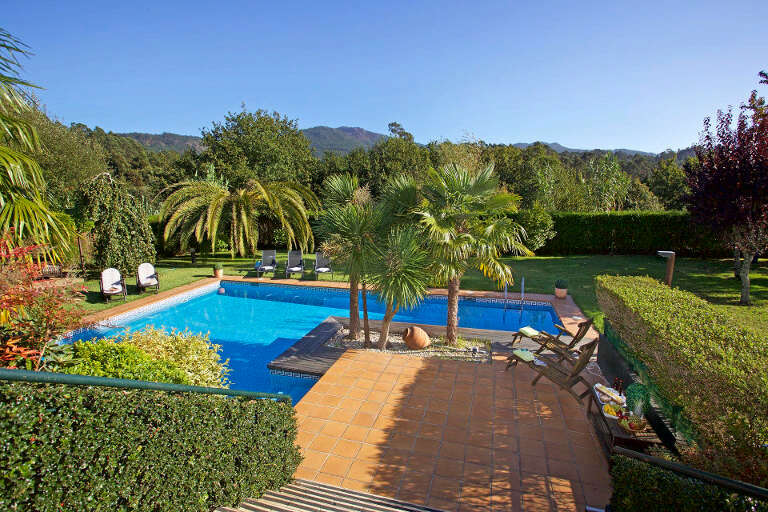 There is one just outside Baiona (Talaso Atlantico) with a sea-water swimming pool and a gym included . It also offers child minding facilities and an excellent restaurant too. Starting in A Guarda follow the road along the bank of the Miño towards Tui, and you'll pass through O Rosal, situated in a valley with a perfect climate for all types of fruit and vegetables as well as grapes. Signs on the road will indicate the bodegas you can visit to taste or buy the wine. Whilst there look out for the 19 Folón mills, an unusual set of ancient mills cascading down from the hillside above O Rosal. One of the best of its type in Galicia. The entry price is very low and the views from the top of the hill over the River Miño towards Portugal and the Atlantic are wonderful. Not far from Baiona, on the coast road south. Follow up with an excellent fish dish in A Guarda, renowned for its seafood. Soak up the atmosphere of the cobbled streets around the Rua Pescaderia and walk through the adjacent park to capture some amazing views of the Ria. The jewel of Galicia where, for more than 1000 years, pilgrims have gathered from all over Europe. Visit the impressive cathedral, the Plaza del Obradoiro and the old pilgrims' hospital, now a luxurious Parador. It'll take a liitle over an hour and a half via the motorway.